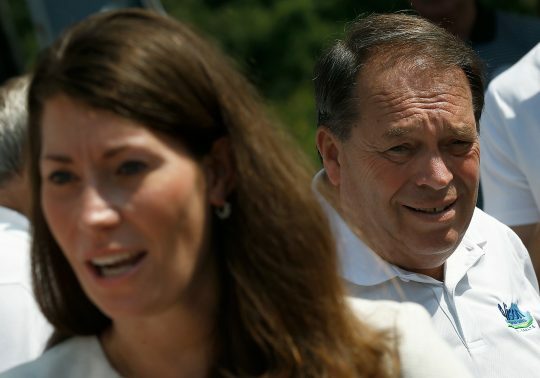 Prominent and powerful Kentucky Democrat Jerry Lundergan was indicted Friday for making a series of illegal campaign contributions to his daughter's campaign. Federal prosecutors allege that Lundergan made corporate contributions that exceeded the $25,000 limit to Alison Lundergan Grimes' failed 2014 Senate campaign against Majority Leader Mitch McConnell (R., Ky.). Lundergan has been indicted on 10 counts, while fellow political operate Dale Emmons was indicted on six. Lundergan Grimes, who serves as Kentucky's secretary of state and has hinted she might run for governor in 2019, responded to the allegations on Twitter, promising her father would be vindicated. Lundergan served three terms in the Kentucky House of Representatives, and twice served as chairman of the Kentucky Democratic Party. His final state house term ended in 1989 after he was convicted of using his political influence to secure a no-bid government contract for his catering company. The conviction was late overturned on appeal. The Lexington businessman soon regained political power by becoming an early supporter and personal friend of Bill Clinton. In 2008, he served as state chairman of the Hillary Clinton presidential campaign. Both Clintons would later campaign for Lundergan Grimes in 2014. This entry was posted in Politics and tagged Alison Lundergan Grimes, Kentucky. Bookmark the permalink.